If you had a total of 8 square feet of entryway space, what would you do with it? 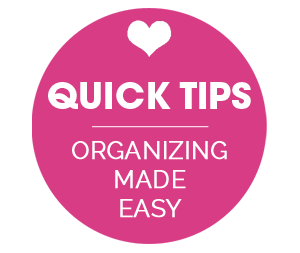 One thing I love about contributing writer, Palak of Make it Handmade, is that she loves to sew and create storage on a budget. 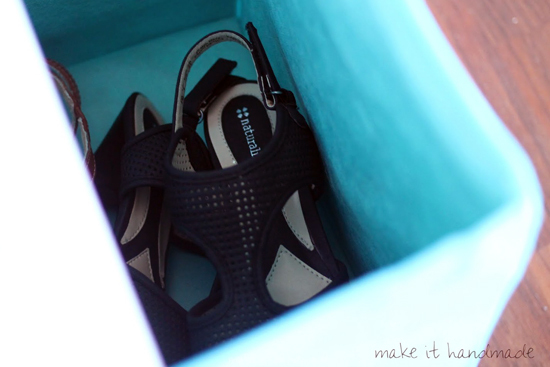 Her entryway is no exception as she tackled the super small space with a super big heart. 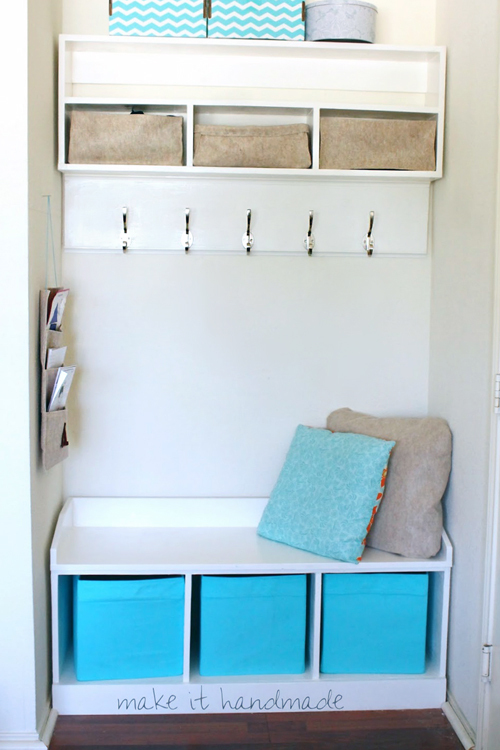 She and her husband took on their first building project to build in a bench and upper storage from scratch, and from there she also created some DIY felt storage bins. She is stopping by today to share a bit more about how she truly "made" every last bit of her budget friendly entryway. Hello I Heart Readers! 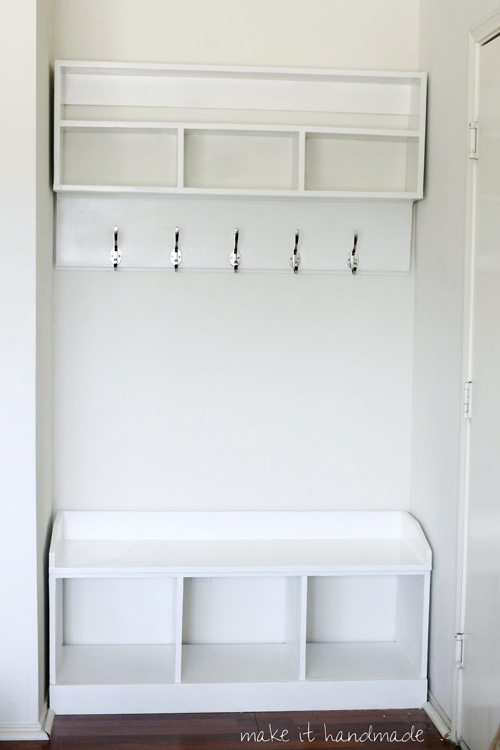 I'm back today with a "tour" of our newly built Mini Mudroom. It's not much to look at, but right now it's my very favorite 8 square feet in our home. When we bought our home, there was a small recess right behind the garage door that was perfect for a small bench. I searched and searched for a bench to fit the area exactly, but couldn't find one that fit with my taste or our budget. But now that both kids go to school, we really needed a place for them store their bags, folders, show and tells, sneakers etc. So, even though we've only used our jigsaw once, my husband and I set out to make a mud bench. We roughly followed this plan from Ana White. I modified the bench plans to fit our IKEA expedit containers and to be deep enough to be comfortable for us to sit on. We were able to cut costs by using plywood instead of solid wood and omitting the back of the bench, so the whole bench only cost about 40 dollars in wood. The cubbies on the bottom of the shelf are the DRONA boxes from IKEA. They hold our spare shoes, items that need to be returned to the store or grandmas, and all those hats I knit. The shelf we cobbled together from scraps from the bench and our garage. 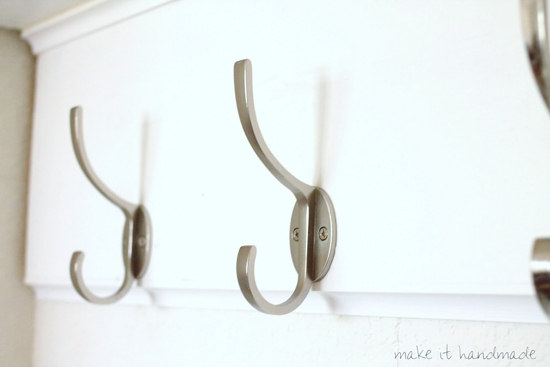 Our big splurge were these hooks from Lowes. There are wonderful DIY options for hooks and knobs, but at the end of the project these felt like the icing on the cake. Because the shelf was from scraps I didn't have any baskets shallow enough to fit the upper cubbies. I really loved these soft baskets from Ikea, but again, they weren't the right size and they were very expensive. So I had to sew up my own. These baskets fit perfectly in the space I have, and have an "unique expression" just like the ones in the IKEA catalog. 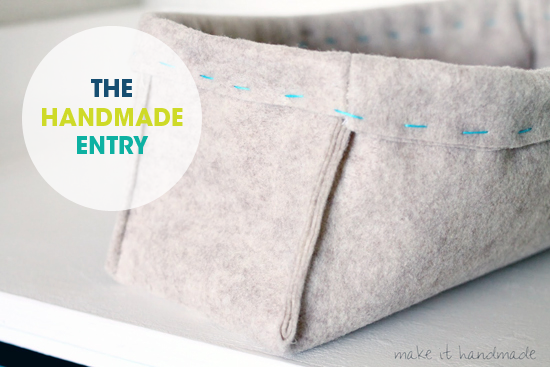 If you want to make your own in any size, check out my Felt Basket Tutorial. These are perfect for those items that I want to keep out of sight and out of reach of little hands. One basket holds our wallets and umbrellas... and there might be a little chocolate tucked in there as well. In a non cuffed bin I'm keeping all those unsightly grocery bags. We used to keep these in the pantry and I'm so glad to get them closer to the car so I'll actually remember to take them to the store! 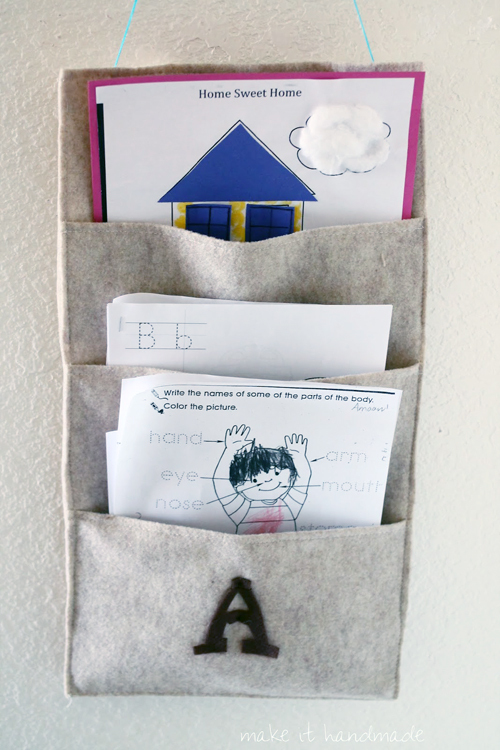 With the leftover felt I made a little homework organizer for the kids. This way we'll always know where that folder is at the beginning of the week! For our first big furniture diy project I'm ecstatic with how it turned out! I still would like to add a few things to make it special -- I'm loving this chalkboard wall in Christie's Magical Mudroom. 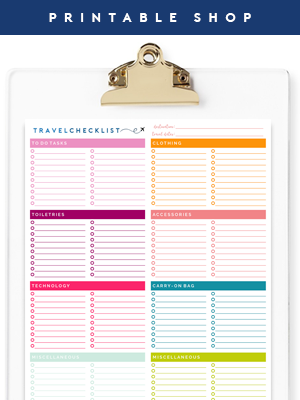 I think a small version would be perfect for the space! 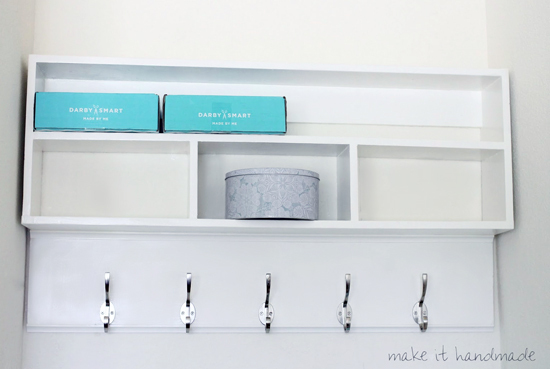 How do you dress up your mud room? Thank you for having me over to share my space, Jen! 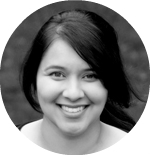 "I'm Palak-- a slightly sleep deprived mom who has loved sewing, knitting and crochet for her whole life. 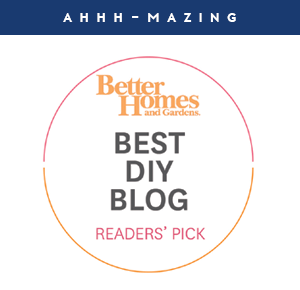 When I’m not chasing after my two rambunctious kids, or sitting behind my sewing machine, I write about my DIY exploits at my blog, Make It Handmade. I also own Sewistry, a site dedicated to stretching our sewing dollars with money saving projects, product review and buying guides. 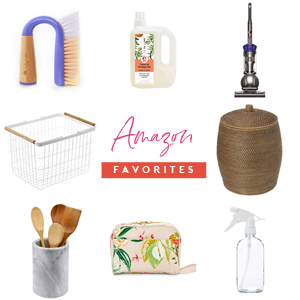 Although organizing doesn’t come naturally to me, I’ve been inspired by Jen and her blog to find the joy in making my home beautiful and functional. 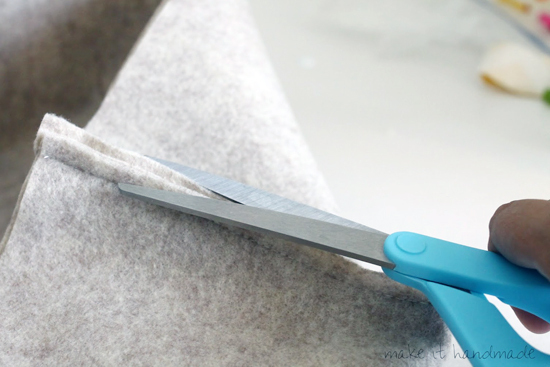 I’m transforming my home one room at a time and using my sewing machine every chance I get! I’m simply elated to be able share sewing projects for your home as part of the IHeart team! " You know I love you Jen and your grammar is usually right on, but I'm an English teacher so I just have to point out that it's "She and her husband..." rather than, "Her and her husband..." You're a super, fabulous, talented, sweet and wonderful blogger so please no offense intended by me correcting your on out of 5 million grammar snafus. And I think you are super sweet. I never mind grammar feedback, especially when it shared to politely. Thank you so much!! 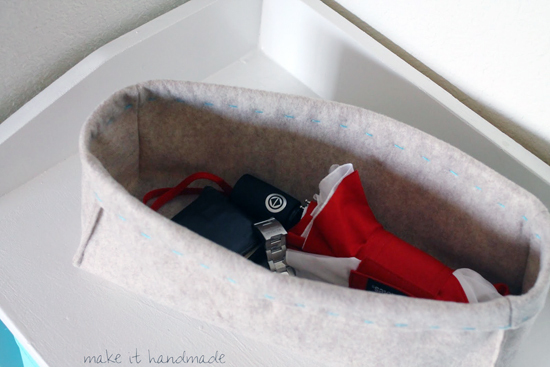 The felt baskets have so much more heart than anything you could buy anywhere - beautiful for your family. Enjoy your welcoming space. I love this whole project- looks great! My 7 year old daughter and I commented to each other how easy it would be to hang up your coat on one of those beautiful hooks, sit down for a minute-ahh-and then put your shoes in a basket below. Yes! I'm not so patiently waiting for the weather to get cooler hear in Texas so we can actually use our jackets! ha! I do-- I also show it off to guests; even though they come in the front door! Great project! 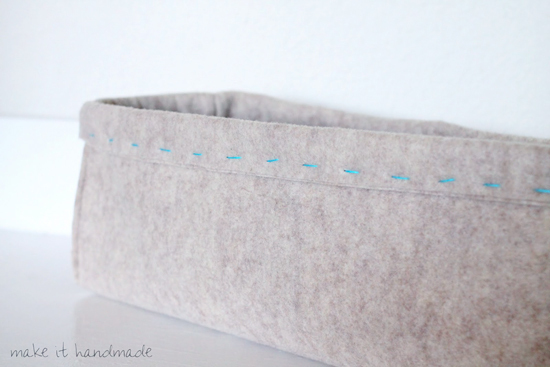 Also love the felt bins - so simple and pretty. It is really inspiring to see how much you can do in a small space. 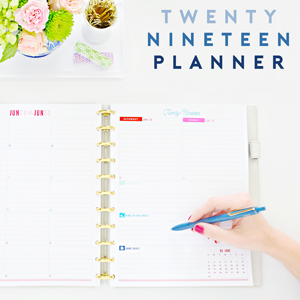 No doubt your everyday life will be made easier with your awesome project! Thank you Kim! It's already making a difference in getting everything put away quickly. Love the felt baskets! The whole area is so pretty. Congrats on your first building project, Palak, it looks great! Thank you Amy! So glad you liked it! Love this build and the felt baskets are soooo adorable! "Brag Post of the Day" on our Facebook page, thanks for sharing!